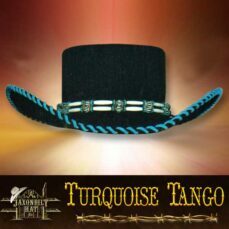 The newest addition to JAXONBILT’S fine line of cowboy hats! Six by Six. A full 6” crown and 5” brim, a hat to wear for those special occasions. Women set the trend in “big” hats from the late 1800’s to the early 1900’s. Today everyone wants a big hat with a wide brim. The “Mirage” is only one style of many available from our fine line up of hats. A wide choice of colors and styles await your selection. 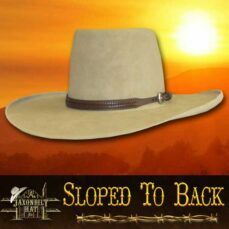 Our “Conformer Kit” is delivered free and insures the fit of your hat choice. We can custom make this hat with one change. 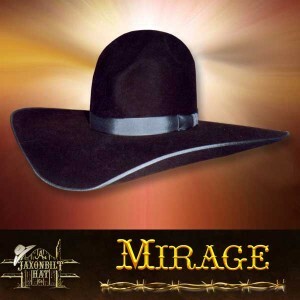 The wide brim is no longer possible to make. The max brim width will be a maximum of 4 3/4 to 5 inches max.